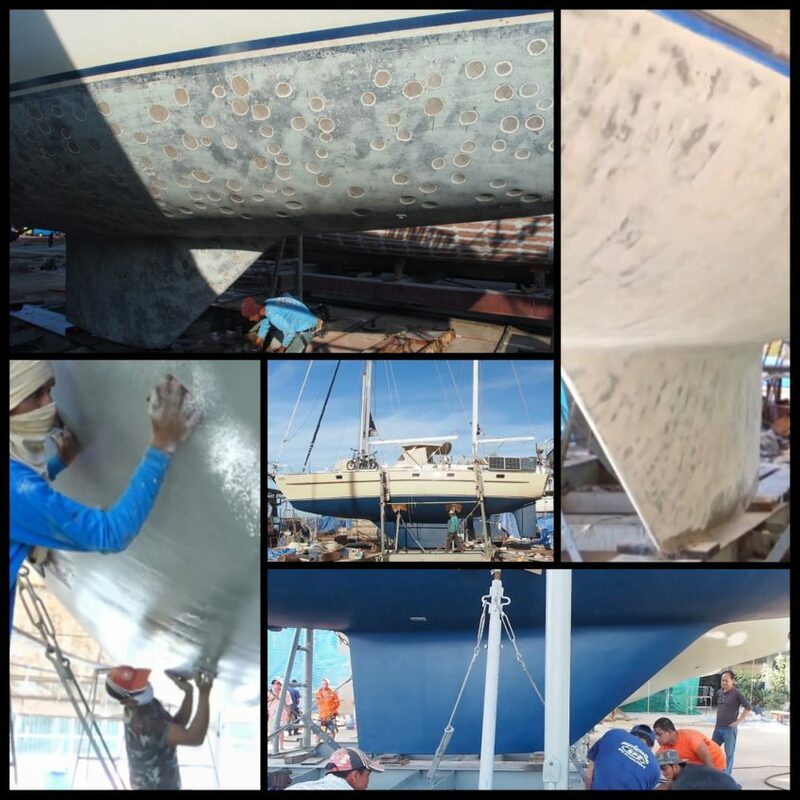 The third in our series of articles about SY Esper’s complete refit in Thailand for Sailing Today looks at the hull, and how we dealt with the blisters. We also look at the brilliant work carried out by the machine shop. One of the reasons for our visit to PSS boatyard was to determine what course of action we needed to take to tackle osmosis in our Oyster 435. We had dealt with the biggest blisters in the Maldives, but knew there was more work to do. 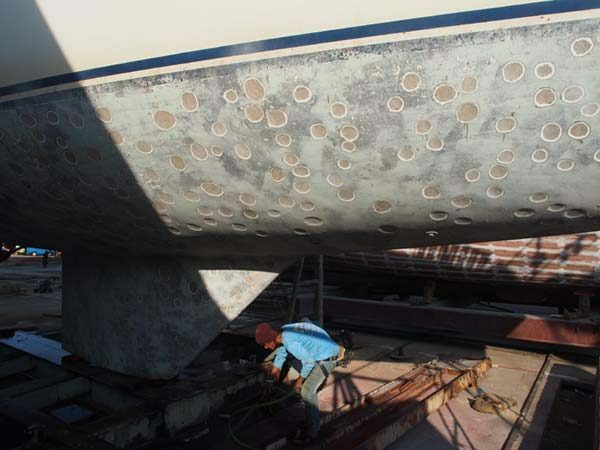 First of all we made a detailed inspection of the hull, testing several areas to see just how deep the blisters went. As we dug further, a vinegary liquid oozed out of the blisters and dripped down the surface, a clear sign that hydrolysis had occurred between the gelcoat and layers of resin and glassfibre. 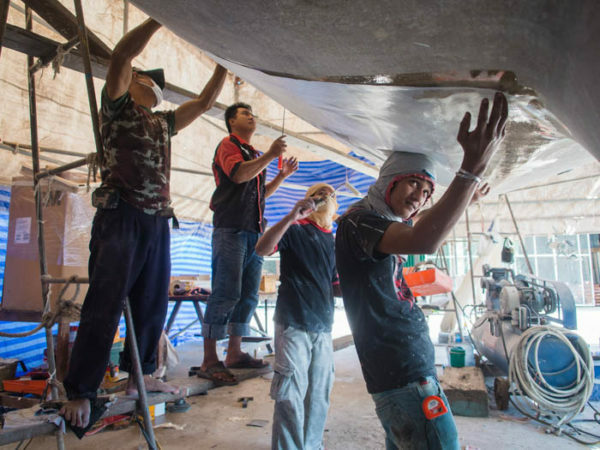 The main advantage of having work done in this part of the world is the low cost of labour, so we were able to start grinding back the whole hull for further inspection. Over five weeks, the yard workers had been round the hull with the grinder four times. 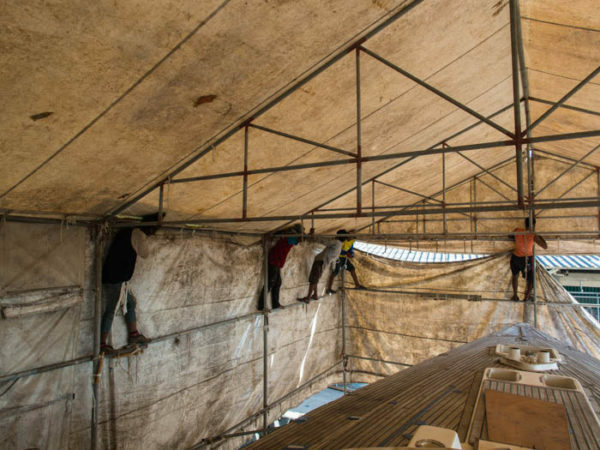 At each stage they lifted just a thin layer for us to inspect with our local project manager. Eventually, we realised that all the gelcoat had to be removed, so now we were down to naked GRP. The holes had stopped weeping, but the hull was likely to be harbouring a concentrated solution of acid and blister-forming juices which had caused the bubbling. 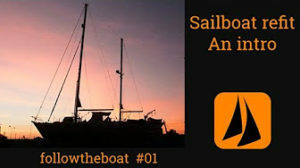 By now, we had calculated that our stay in the boat yard would likely exceed nine months, which meant a decent length of time to start the flushing and drying process. From the beginning we had regularly washed the hull, but now we stepped this up. Over the coming months we saturated the exposed surface every morning and evening with fresh water, allowing it to dry overnight. And at this point we started taking regular moisture readings at the same time of day in the same precise area, to keep a record of any changes. 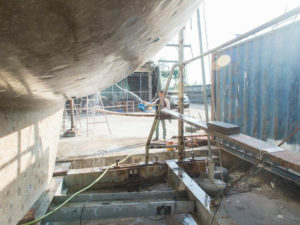 After five months we were ready to begin rebuilding the hull. 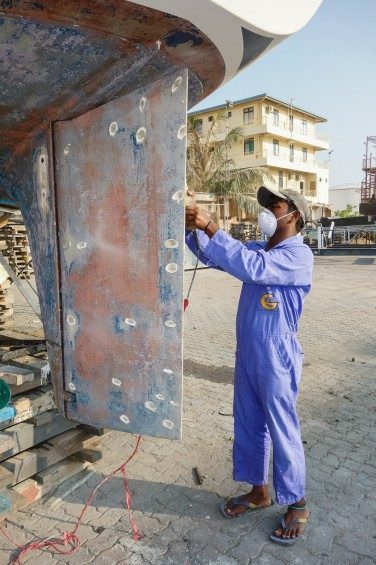 Our hull team began by lightly sanding the hull to a smooth finish. Then they applied double layers of West System epoxy and biaxial glassfibre cloth to strengthen and build up the GRP. This is a delicate job, so they borrowed one of the paint team to help with the application of the epoxy, which must be smooth and bubble-free. Once the surface had cured, the next step was to apply more layers of epoxy and to fill and fair. 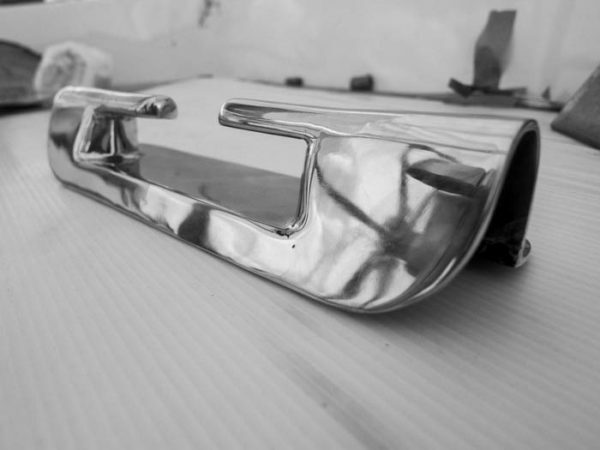 We used West System’s 410 Microlight fairing compound mixed with epoxy. As the process progressed, any dips and blemishes were filled and faired to a smooth finish. Finally, we applied five layers of Jotamastic 87, a two-part epoxy mastic coating. Then we left the hull alone while we continued with the rest of the interior and deck work. UPDATE – We are hauled again in Thailand four years since the osmosis treatment, and are pleased to report no bubbles! PSS is justifiably proud of its stainless steel workshop, so we took advantage of our time there to work with them on a number of projects. We extended the tubular guard rail from the stern to side gates, giving us a lot more room to attach essential items like the solar panels, as well as a more solid rail to cling to in stormy weather. 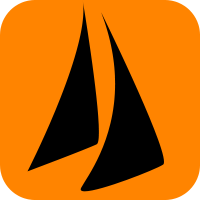 Together we designed a new pivoting bow roller for the anchor. The 33kg Rocna we bought in Turkey was too heavy to pull over the old roller, so Jamie often had to hoist the last metre by hand. 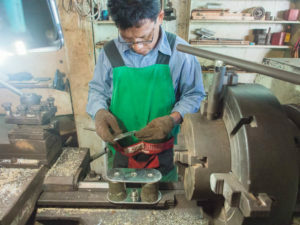 We asked the machine shop to cut down to size our existing brass rollers, and set them in a new rocker. They also made a bed for the new roller because the removal of the teak meant the old one no longer fitted. Then the machine shop made a new bow plate to replace the old dented one. In between larger jobs, they knocked up mounts for deck and mast paraphernalia like navigation lights, GPS mushroom antenna, radome, barbecue and more. When we realised the old brass fair-leads would no longer fit in the new teak toe rail they made new ones for us. Fed up with hauling the dinghy up the side of the boat every night using a complicated rope system, we finally had davits made in the workshop. 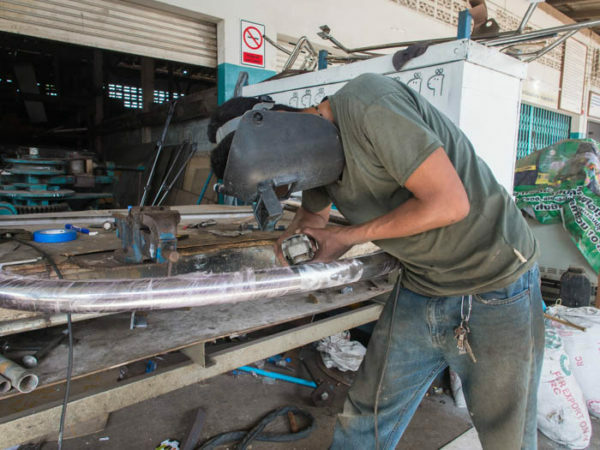 When it came to a new swimming platform, we had to enlist the help of a machine shop in Hat Yai to bend the 3in outer stainless tube to shape. This was one of the few jobs in which mistakes were made. Admittedly it was not a straightforward design because the platform has to accommodate our Pacific Plus Windpilot. We wanted wide teak slats rather than stainless steel, so the head carpenter was enlisted to come up with the template. His first attempt took him all day, and would have been perfect if he hadn’t misread the depth measurement. On day two he presented a perfect template from which the stainless measurements would be taken. Sadly, the machine shop bent it to fit around the template, rather than within it. 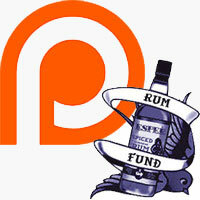 The tube was sent back, but could not be bent any further without affecting its integrity. PSS cut out a section in the middle and welded it back together to fit the template. We disassembled the Max Prop and drilled in two grub screws so we will be able to grease it without disassembly. This gave us an opportunity to take out the shaft and inspect it. We found evidence of shaft crevice corrosion, although it was not too bad we knew it would be foolhardy not to use this opportunity to replace it, so the machine shop made a new one for us. The old cutlass bearing had seen better days so we sourced a local replacement made from Torlon. Finally, Jamie replaced our old stuffing box with a PSS Dripless seal. 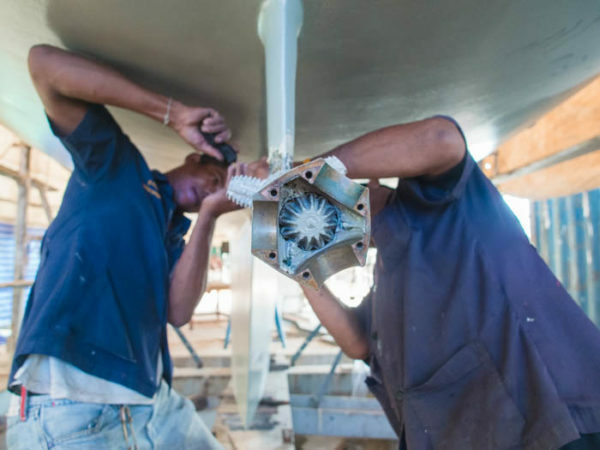 We hope it will mean less maintenance and inspections… and drier bilges.